For the first time David Bowie's legendary 21-song, greatest hits Glastonbury headline set has been released in its entirety. Available as 2CD/DVD and 3LP vinyl sets here. Physical formats feature David’s fascinating diary (originally written for Time Out), with insights into Glastonbury rehearsals and preparations. Spotted the latest instalment of Bowie TV on the Official David Bowie YouTube channel yet? In Bowie TV: Episode 12, the impossibly handsome PR poet that is Alan Edwards, recalls the vision of “King David” arriving in the mist to conquer Glastonbury with the weapon of well-crafted songs and a performance to be remembered for evermore. Though it’s still the 26th on the other side of the planet, New Zealanders are already firmly in the future where it is almost November 27th. However, 35 years ago today, the 26th of November 1983, was the day that more than 80,000 of them gathered in Auckland for the last stop of the Australasian leg of The Serious Moonlight Tour. At the time, it was claimed that this was: “the single biggest concert ever in the Southern Hemisphere”. Read more about this particular show and Bowie’s other ventures down below on the superb @bowiedownunder FB page. What’s all this got to do with the Denis O’Regan Ricochet contest, you ask? Well, aside from the fact that Denis took that aerial shot of the Auckland crowd, not to mention the other shot of DB in our montage, today is the last day of the contest, which we launched three weeks ago. Find the contest here on FB. But please read carefully, as many hopeful ‘entrants’ so far have either neglected to use the required #DavidBowieRicochet hashtag or to follow @Bowie1983Book – If you’re one of those, you are welcome to re-enter including all that is required, for a chance to win your own limited edition Ricochet boxed set (RRP £3,000/$4,000). 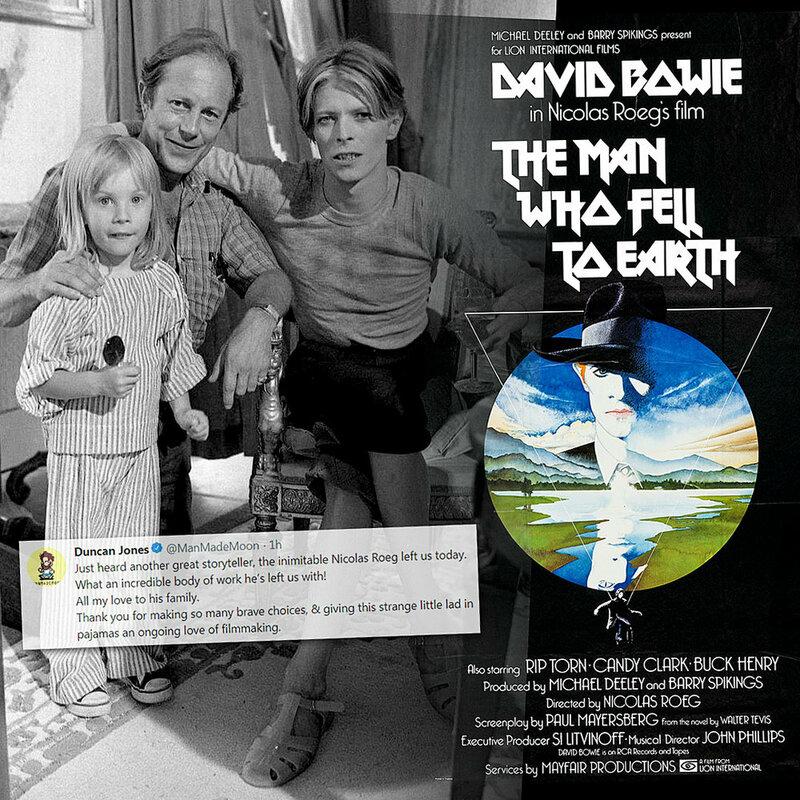 David Bowie’s film director son, Duncan Jones, paid tribute on Twitter today to the visionary Nicolas Roeg. Roeg’s family broke the news earlier today that the 90-year-old director had died. Bowie fans will know him best for being the man behind The Man Who Fell To Earth, Bowie’s first leading role proper. Roeg leaves a remarkable canon of work and you’re in for an absolute treat if you’ve yet to discover it. Just heard another great storyteller, the inimitable Nicolas Roeg left us today. What an incredible body of work he’s left us with! All my love to his family. Thank you for making so many brave choices, & giving this strange little lad in pajamas an ongoing love of filmmaking. Of course, the irony is that when the Breaking Glass Live EP was originally released on 17th November 1978, it stalled at #54 on the Official UK Singles Chart. It was a glitch, the next single, Boys Keep Swinging, went Top 10. So, thanks to all of you for ensuring that the poor performance wasn’t repeated forty years later, the EP has entered the UK’s Official Vinyl Singles Chart at #1 this evening. If you bought this new version, did you open it yet? Have you played it? Aside from the fact that this is a 4-track as opposed to the original 3-track, which EP do you prefer? Our montage shows the original 1978 trade press advert and both sides of the current UK #1 vinyl single. Save 20% on apparel, accessories and more. Discount automatically applied on checkout. Sale ends at 11:59 pm ET on November 25th. Offer excludes media and items printed on demand. FOOTNOTE: The image used in our graphic was taken fifteen years ago today by Total Blam Blam, at the second of two shows at the Point Theatre in Dublin, Ireland. Both shows were recorded and released on the A Reality Tour DVD. The most recent post has Mark Plati talking about the preparation for and anticipation of Glastonbury 2000, and how Bowie’s enthusiasm meant he literally sang himself voiceless at one of the New York warm up shows. 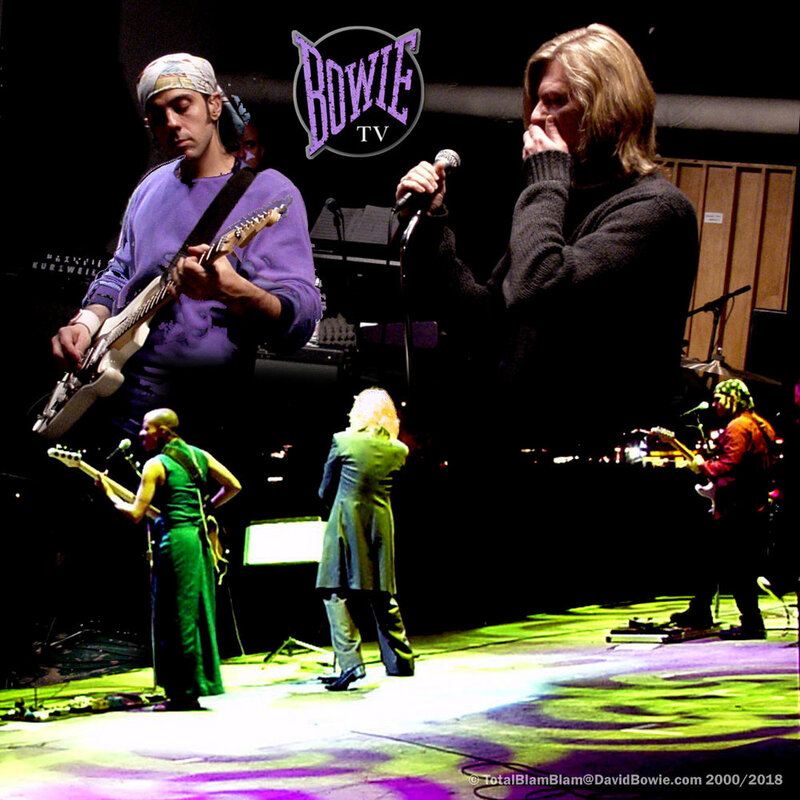 Our image shows Plati and Bowie in rehearsal in June 2000, along with a shot from the back of the Glastonbury stage, where they are pictured with Gail Ann Dorsey delighting the Glastonbury audience, as captured in the upcoming Glastonbury DVD. Check out Bowie TV here. Today marks the 45th anniversary of the broadcast of David Bowie’s The 1980 Floor Show, which was used as both a promotional tool for Pin Ups and to further break into the American market. It would be Bowie’s last performance as the Ziggy Stardust persona with The Spiders From Mars, though drummer Woody Woodmansey was no longer a part of the band line up. The 1980 Floor Show was a lavish stage production filmed over three days at The Marquee Club in London’s Soho, in front of members of Bowie’s fan club, exclusively for the American NBC TV late night show, The Midnight Special. The show was heavily advertised in the US press in the run up to the broadcast but has never been shown outside of the US or officially released. Only one track, Space Oddity, has ever received an official DVD release and though many fans have found their own way of finding the complete show, most still hanker after a full official release. Meanwhile, don't forget the Pin Ups Radio Show on Spotify with exclusive recollections from Bowie made in 1973. The current issue of Record Collector (December 2018) celebrates 1973, and among other Bowie-related bits, has a great piece by Kris Needs regarding his close encounters with Ziggy, including witnessing the taping of The 1980 Floor Show. Thirty-six years after he originally recorded the track LET’S DANCE Nile Rodgers has produced a very special orchestrated version which is featured on the newly released album 80’s SYMPHONIC. Speaking about this new version Nile commented “My work with David Bowie and specifically “Let’s Dance” is sacrosanct to me so when I was asked to add orchestration to the original recording I approached it with extreme trepidation. In fact my only concern was to protect David’s artistic vision and integrity. In the end I’m very grateful that we did this, as I believe anyone who loves the original will be excited by it. I’m certain David would approve from above”. Also featured on the digital single is an alternate version of the original demo which was recorded on the 19th December, 1982 at Mountain Studios in Montreux, Switzerland. This version features a spoken intro from Bowie joking that if Nile or the band make any mistakes he’ll fine them just like James Brown would do to his band. Original recording engineered by Bob Clearmountain for Fast Forward Productions. Engineered By Sam Okell at Abbey Road Studios. Unicef announced today that it is releasing 50 special, limited edition blue vinyls of 17 cult, classic and contemporary albums to raise funds and awareness for the Children's Emergency Fund. The albums will be made available via a prize draw. One of the records is David Bowie’s #1 album, The Next Day. There are dozens of chances to win the limited edition specially pressed blue vinyl and each one will be adorned with an edition sticker as well as a holographic Unicef Blue Vinyl sticker on the cover. All money raised from the sale of Unicef Blue Vinyl albums will go to Unicef UK’s Children’s Emergency Fund. The Children’s Emergency Fund helps Unicef deliver life-saving food, clean water, health care and education for children, as well as protection from violence and abuse. 100% of proceeds from Unicef Blue Vinyl will go to Unicef UK’s Children’s Emergency Fund. Your entry can help Unicef keep children safe, whenever and wherever an emergency hits. For every 10 entries purchased in the prize draw, you will receive one bonus entry for free. The prize draw closes on Monday 10th December 2018 at 22:00 (GMT). Much has been written about The Buddha Of Suburbia since its release in the UK twenty five years ago today. One of Bowie’s own favourite works, this ‘soundtrack’ album seems to have flown under the radar for far too long. If you’ve not heard The Buddha Of Suburbia, here’s what you’ve been missing out on for the past quarter of a century. The more affordable version of Denis O’Regan’s Ricochet is out now and to mark the fact we’ll be launching the contest to win the full deluxe gigantic Ricochet : David Bowie 1983 on Monday. Meanwhile have a poke around here.